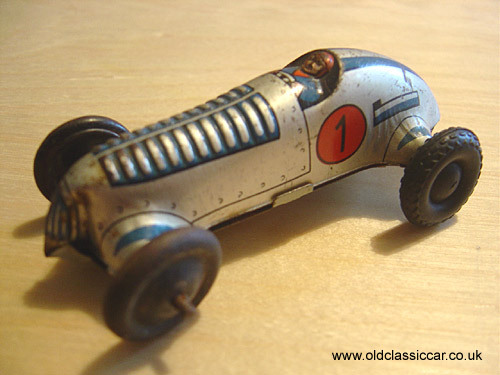 One of several producers of tin plate toys that could be found in Germany post-WW2, this racing car toy from Gama must date to some time in the 1950s. The clockwork motor in this one still works aok. Many earlier tin toys had separate drivers pressed from their own bit of tin, it was then slotted into the cockpit. By the '50s many companies were cheapening things, as with this toy, and incorporated a flattened driver behind the wheel. Colour: silver with blue flashes, wind-up clockwork motor. A later Gama racing car, labelled as a Matra F1 and dating to the late 1960s, can be seen here.